According to a recent Motorola research whitepaper, by 2017, roughly half of all in-store transactions will be completed via mobile devices. With customers using a mix of several channels to research and buy products, it has become essential for retailers to provide them with a seamless omni channel experience in order to retain them. 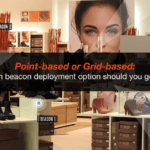 To stay ahead of the competition, retailers are investing in iBeacons & location-aware mobile apps to improve their customers’ shopping experience. We’ve put together an infographic that presents 5 tips that retailers can employ to improve their in-store experience and keep today’s mobile customers happy.